With excitement already brewing for Fashion Week 2019 and designers get ready to unveil their latest collections, acclaimed Singer/Songwriter Brooke Moriber is gearing up to do some unveiling of her own. With her upcoming Cry Like A Girl album set to drop later this year, she’ll showcase some of the new music -- which she recently completed recording in Nashville, Tennessee, with legendary producer Fred Mollin (Sheryl Crow, Vince Gill, Shawn Colvin) at the helm -- during the Mark De Alwis Salon "Meals on Heels" Hair & Fashion Show Sunday, February 10th AND the SMGlobal Catwalk at Manhattan’s Watson Hotel (440 W. 5th Street, New York, NY 10019) on Saturday, February 16th at 6PM! Cry Like A Girl is not only produced by a music industry legend but was also mixed by 5 time Grammy Winner Chris Lord-Alge (Carrie Underwood, Of Mice And Men, Bruce Springsteen). With Parade Magazine hosting the exclusive premiere of the first single and title track, they called it a “high-powered Americana-infused track with an empowering message" and noting that "Moriber makes a compelling case for sharing raw emotion with strong vocals and a spot-on delivery”. Popdust were also swift to jump on board, with the outlet proclaiming Brooke a “powerhouse”. 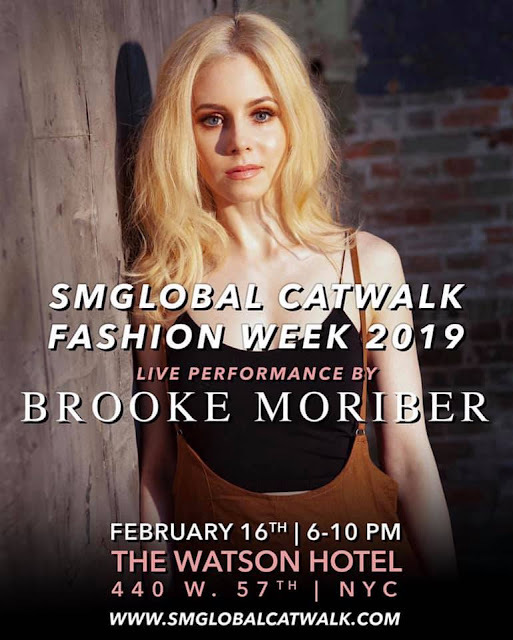 As excitement for the global fashion industries latest trends combines with anticipation for Moriber’s latest music, the two worlds will collide at the Mark De Alwis Salon "Meals on Heels" Hair & Fashion Show on Sunday, February 10th and the SMGlobal Catwalk Fashion Week 2019 event Saturday, February 16th at the Watson Hotel!